Pearl Harbor survivors and military and civilian leaders gather at the USS Arizona Memorial each year on December 7 to lay wreaths and pay tribute. National Pearl Harbor Remembrance Day is observed every year on December 7. On this day, Americans remember and honor those who died in the Japanese attack on Pearl Harbor on December 7, 1941. The Japanese attack on Pearl Harbor lasted less than two hours. During that short time, 19 American warships were sunk or damaged. About 150 planes were destroyed at nearby Hickam Airfield. More than 2,000 American sailors and soldiers were killed. The next day, President Franklin D. Roosevelt asked Congress to declare war on Japan. Congress declared war that day, and the United States entered World War II. 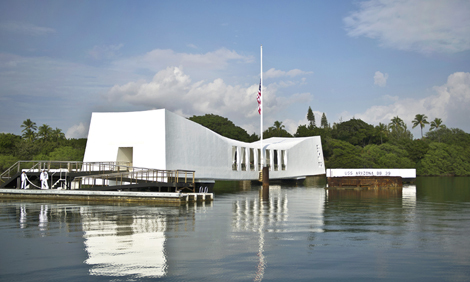 Memorials have been built to remember the events at Pearl Harbor. The best known of these is the USS Arizona Memorial, which was dedicated in 1962. The monument sits on top of the water above the remains of the sunken battleship USS Arizona. It marks the resting place of more than 1,000 of the American sailors who died that day. What is the name of the best-known Pearl Harbor memorial?